The mechanisms employed to animate Karakuri dolls contributed greatly to the development of the principles of modern mechanical engineering. Though Edo-period Japan has often been portrayed as a technological backwater in comparison to its western European analogues, wooden robots employing precision machine technology did not exist in these countries at the time. Meanwhile, their design had already been perfected in Japan. “This wooden robot culture dating from the Edo period probably had an impact on the present-day automotive and industrial robotics industries in Nagoya, whose products are consistently some of the best-selling of their kind. The same mechanical skill applied to wood to create these dolls in the Edo period was applied to iron starting in the Meiji period, giving Nagoya artisans a certain authority which helped them play a large part in the industrialization of Japan” (Suzuki Reiji, Karakuri Yume Kōbō p. 2). “When Japan opened its doors to the world during the Meiji Restoration, the technology which had permitted development of Karakuri dolls soon joined with new technology from Europe, spurring the clock making and automotive industries to develop in this area and forming the cornerstone of today's industrial base” (Nishio Takeyoshi, Karakuri Yume Kōbō p. 4). Aichi's float parade Karakuri dolls were born out of the intersection of Kyoto doll making techniques, Osaka puppet theater, and Japanese clock making techniques developed in Nagoya. Much like in clock making, the creation of a single parade float required the expertise of tailors, sculptors, carpenters, joiners, and other specialized craftsmen. This represented a wide-ranging, systematic division of labor like the Kanban Hōshiki system currently in use by Toyota. 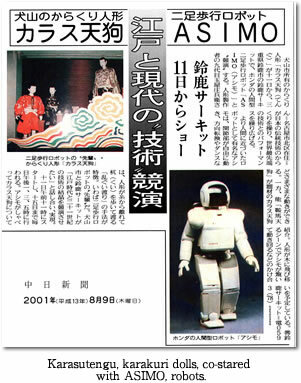 Karakuri doll making was much more than a productive use of technology. For hundreds of years, the Karakuri parade floats were a beloved source of entertainment for both craftsmen and the Japanese public. They also played an important role in spurring interest in science and technology. Karakuri dolls are wooden automata that have helped familiarize the common people of Japan with robots since the Edo period. Riding on this technological wave, Japan's industrial technology, especially in the fields of industrial robotics and androids, is among the most advanced of its kind. The purpose of Karakuri dolls has never been to achieve perfectly human-like movement. Karakuri dolls will never revolt against human will or go on a rampage. Karakuri dolls always work for spectators or the people around them. From the beginning, the essence of Karakuri dolls has been their ability to bring delight to those who see them. 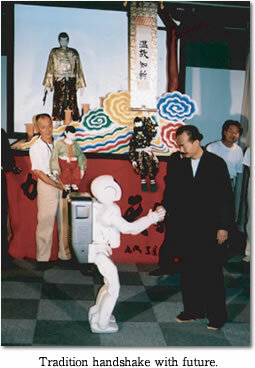 The coexistence of humans and robots is one of the key issues of 21st-century science and technology. The key to resolving this issue lies within Karakuri dolls. Karakuri dolls are perhaps the reason that the Japanese are the only nation in the world to harbor a favorable impression of robots. In order to promote this viewpoint, the ninth generation Tamaya Shobei contributes in every way possible to preserving the culture of Karakuri parade floats, in the hope that generations to come will continue to love and appreciate these spectacles.